The MPK pr. 122A is a rank I Soviet sub-chaser with a battle rating of 2.0 (AB/RB/SB). 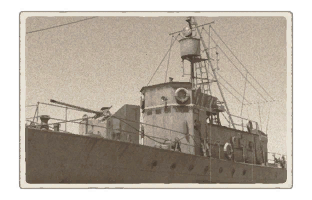 It was introduced during Update 1.79 "Project X" when the Soviet fleet was implemented into the game. Due to its large size and decent crew, this is a difficult boat to sink. The whole vessel is unarmoured except for the gun shield, meaning that machinery and ammunition are left exposed. Although magazine explosions are rare, it's common for both the gun and engine to be knocked out, either of which will spell disaster for this vessel. Fortunately, due to its size, the crew is spread out and there are more compartments to disable, increasing your life expectancy greatly. The boat is reasonably fast in a straight line, able to keep up with slower PT boats and outpace German minesweepers. However, turning is awful due to large hull length. The boat tends to spin, meaning the stern will hit rocks or the shoreline if sailed too close. Stopping distance is also a problem, with no easy way to escape trouble once you’ve found it. All in all, it has decent mobility, adequate for the role but it does have some shortcomings to be mindful of. Primary armament consists of a single rapid fire 76mm gun positioned on the bow, which is able to shred smaller boats in a few hits while holding its own against larger vessels. The gun is protected by steel plate, however due to its position, it will often get knocked out by enemy fire. HE is deadly against small and medium sized vessels, disabling compartments in one or two hits. 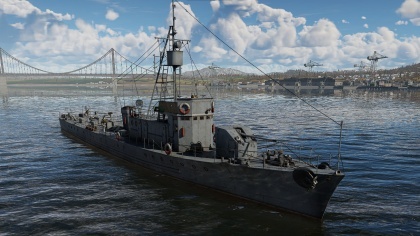 While AP is good for armoured targets such as the Soviet gunboats, it will over-penetrate most vehicles this boat will face. Secondary armaments that also double for anti air duties on the vessel is the three 12.7mm DShK heavy machine guns in single mounts at the stern. While they may be classed as combined AA/auxilaries, they are only really useful for engaging aerial targets. Due to the location of the guns, they have decent firing arcs and have no problem tracking low flying aircraft. Optimal range for these guns is less than a kilometer, where their combined fire will easily down any aircraft that loiter in the vicinity, while gunners will start opening up from 2km away. While depth charges and bomb throwers can be equipped, they are mostly useless and should only be used in specific situations, otherwise concentrate on using the guns. Also large, tough bombers such as the Catalina or Wellington will break through your air defense, try and keep moving and not make yourself an easy target.